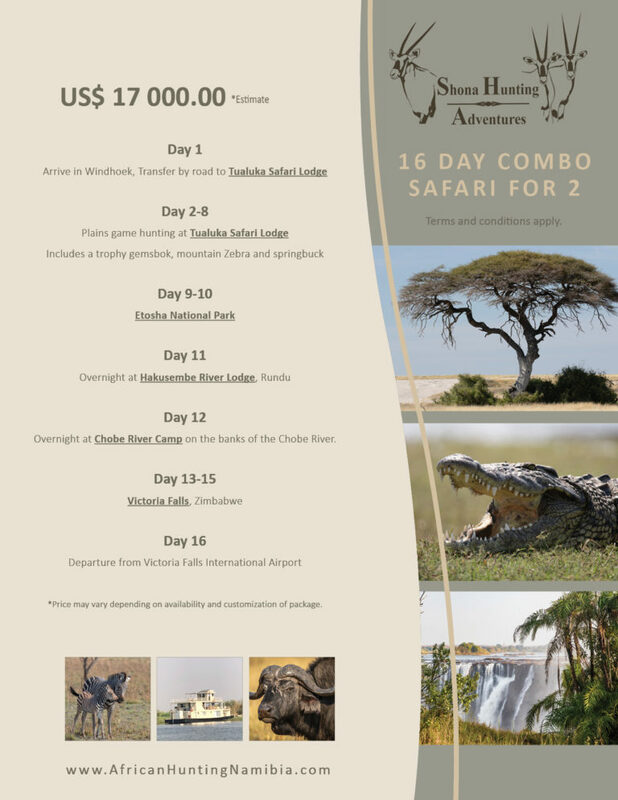 Click on above images to view some of our Combination Safari Packages. Please note that not all species are available at one single camp. Please confirm availability of species at each camp. 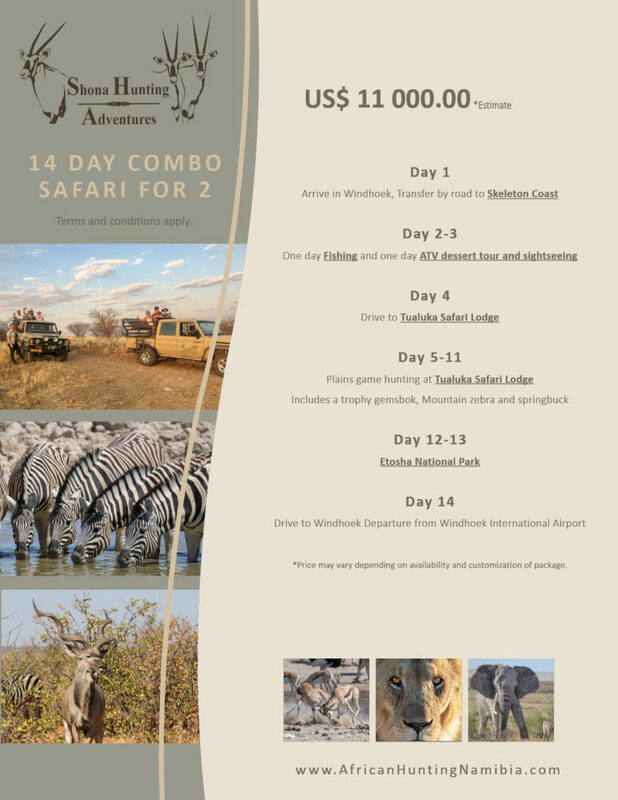 Package includes: vehicle cost, guide fees, 3 nights’ accommodation at Hentiesbay, 1 day of surf fishing, 1 day ATV dessert tour and all meals. ROCK ENGRAVINGS, CHEETAH RESERVE AND HIMBA CULTURAL – Excursion done from Tualuka Safari Lodge as a day trip on a standard hunting package or as extra day add on. TWYFELFONTEIN ROCK ENGRAVINGS – Excursion done from Tualuka Safari Lodge as a day trip on a standard hunting package or as extra day add on. Note: Third party prices subject to change. All terms and conditions apply. There are many facets to modern day African hunting safaris. Whether it is a Hemmingway- style tented bush camp, a luxurious 5-star lodge experience, a group of distinguished gentleman or a whole family looking to make Africa their next family vacation destination. We at Shona Hunting Adventures specialize in customizing your safari to fit your needs and expectations. Contact us today for a customized quotation. A non-refundable deposit of 50% of the daily rate is required at booking, and a non-refundable deposit of 30% for a package. Trophies, dipping, packing and shipping of trophies are excluded from the daily rates or the packages. The hunting permit, PH services, use of hunting vehicles, the initial preparation of trophies, all meals, soft drinks, wine, beer and laundry service are included in the daily rates or package. Hard liquor will be charged. The issuing of permits for some species is subject to quotas. Wounded and lost game will be considered taken and charged at full price plus an additional 15% VAT. Any package animals not taken, will be fully refunded. Trophy fees included for one of each listed animal in package hunts. All other Terms and Conditions as stated in Condition of Business are applicable. Please contact us to confirm what additional species are available out of each camp. Addition species to be added at current pricelist.